I'm a fan of Google Photos. Sure, the next time Google's coin flips Evil side up my kids will appear in ads for laundry detergent. I get it; I'll delete my Google Photos then. I'm resigned to 2 year lifespans for Cloud services -- which is why I keep local control of things I care about. It's not like there are good alternatives. Facebook? Many of my relatives don't use it. Smugmug? Expensive, can't do shared albums. Flickr? They've blown it so many times. Dropbox? I fear the end is in sight. Apple? Seriously? Apple? Oh, I get it. You were pulling my leg. So, Google. Among other things it means I can keep using Aperture for another year, hoping for better than (ugh) Photos.app 2015. Uploading from Aperture is awkward though. There's no Export Plug-In, my old Picasa plug-in died when Google terminated its ClientLogin API last week. If I use the Google Photos desktop web UI I have to export to JPG from Aperture with a unique common string in the file names, upload all files, then do a search/create to put them in a Collection (album). I'd rather use Google Drive. In theory I can create a folder in a special Google Drive "Google Photos" folder and export from Aperture to that folder, managing "albums" as file system folders. I can probably even use some Symbolic Link so the "Google Photos" doesn't use precious SSD space. Google Drive will do all the sync for me. Very nice -- in theory. Riigght. The Google Drive/Google Photos integration isn't yet working properly for non-Plus personal (not Google Apps) users. So be careful. I'll update this blog post if/when it works. 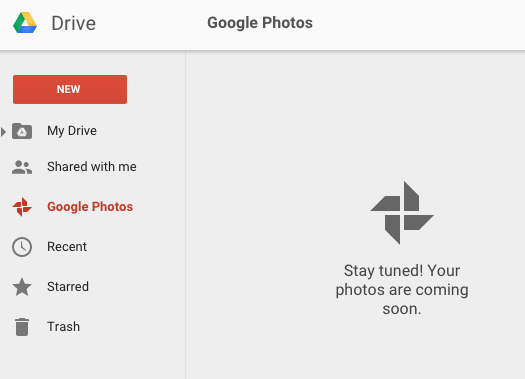 Update 6/1/2015: Don't use Google Photos integration with Google Drive. A day or two after my initial post there are two Google Photos links browsable in the web client view of drive.google.com and one Google Photos folder in my desktop Google Drive collection. The Drive_Google Photos link above now shows a view similar to iOS Photos.app, or photos.google.com but without collections. Within "My Drive", and also on my desktop Google Drive, is a folder called Google Photos that holds all of my Picasa photos organized by dates, not by collections/albums. You can add folders and images to the "My Drive" Google Photos folder. They will sync like any other Drive data, but they won't show up in photos.google.com or Photos.app. I've read you can move images around in Google Drive, but this does not affect images on Picasa/Google Photos. So the only thing Google Photos integration with Google Drive is good for at the moment is getting a local copy of the images (but not the album organization) of your Google Photos/Picasa images. It's also a great way to unwittingly blow away all your Google Photos. This has NOT been though out. I'm disabling Google Drive/Google Photos integration and I urge you to do the same. I have the same kind of problem. I completely missed the desktop uploader. Thanks!